Te tau okioki: the sabbatical diaries: Little Sir Echo, how do you do...? "Little Sir Echo, how do you do? but you're always so far away!" I loved the song... especially because it was my job as the kid to echo Grandad with the second "Hello" each time, and one day I totally got it: I was being the echo the song talks about! I was Little Sir Echo! I keep thinking about the links between here and there: home in Aotearoa where I have been based all my life (yes, even when I physically live away) and home here in central Illinois and Missouri (yes, even though I only came here for the first time this week). Here and there. There and here. I'm thinking about echoes. Some of these echoes are thematic. The question of language, which I blogged about back when I was researching in Adelaide in July, keeps coming back... the links as well as distinctions between Maori and German languages throughout these histories. The relationship between faith and difference, and the quiet confidence of the Lutheran church in the unshakeability of an understanding of faith based on grace. The pursuit of higher education, especially as a way to move beyond present circumstances, both collectively and individually. Some of these echoes are unexpected but nevertheless interesting to think about. I am now 36, and some days I feel like I'm kind of 'on the shelf' - that I've missed the chance to meet someone lovely just for me and settle down to have a family - and then I see the marriage certificate between Hamuera and Lydia and realise they were both 29 at the time - and Lydia being 29 back then is kind of like me getting married at 50! - so you see, there's hope ;) Other echoes... Hamuera was asked to address the seminary about the Maori world just before he left to return to NZ in 1912; I know well the feeling of talking about things so far from home, wondering (even as I speak) about what the point of this could possibly be, beyond providing exotic material for later dinnertime conversations. 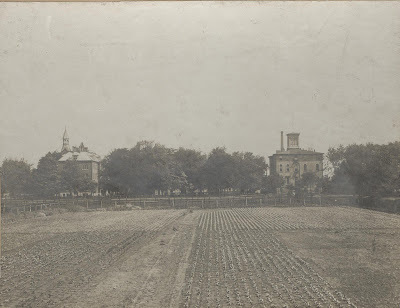 And another echo: this photo of the Seminary shows the size of the garden which fed the men who lived there... reminded me of vege gardens out the back of other houses: in Savoy Rd, McDonald St, Market St, Penrose St, Fergusson Dr.